Houston Heat is this city’s first ever year-round dragon boat club. We are comprised of competitive and recreational paddlers training to compete in local, national, and international competitions worldwide! 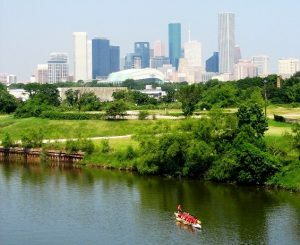 We also strive to promote the rich cultural history of the sport and to bring community involvement and awareness to our paddlers — from working with the Lighthouse of Houston’s blind paddlers, Blind Fury, to promoting greener waterways through Houston Heat Goes Green — we aim to have fun AND do some good! Our Board is committed and highly motivated in making Houston Heat THE standard for all other dragon boat clubs in Houston, Texas, the United States and abroad! Promoting the sport is what we are all about. We’re a unique and mixed cast with experienced and novice paddlers who have a common goal: Let’s kick some Dragon Boat tails! What we’re really about is teamwork, leadership, community, and hard work. And since we work hard, we play just as hard! We strive to be champions on and off the water. So what are you waiting for? Come on out and join us! What is the Houston Heat Dragon Boat Club? What will my membership fee cover? Can I try out a few practices before deciding if I want to join? In how many races will Houston Heat compete? How often are practice sessions held? Is attendance at practice sessions mandatory? What level of fitness and experience is required? Is special equipment needed and is it required? Is the club currently accepting sponsorships? In early summer 2006, a group of paddlers convened to establish Houston’s first year-round Dragon Boat club. In addition to competing in Dragon Boat races, Houston Heat’s goals are to promote the challenging sport of dragon boat, foster the spirit of fun athletic competition, develop strong teambuilding skills, and promote a sense of community amongst our paddlers. Fill out a Membership Form and return it, along with your membership fee, to a Houston Heat representative. Or, email houstonheatdragonboat@gmail.com. The membership fee for 2017 is $200.00, valid through the end of the 2017 dragon boat season. There will also be a ONE-time administration fee of $20 for new paddlers who are new to HH. If you have any questions, contact houstonheatdragonboat@gmail.com. Your membership fee will cover ongoing maintenance and other costs related to equipment including boats, paddles, and personal flotation devices, liability insurance for the team and venue rental. Also, we rely on members to help tow the boats to and from the practice sites for certain practices. The membership fee also helps cover mileage reimbursements to these volunteers for gas and wear/tear on their cars. Sure! Guests will receive two FREE water practices*. The third water practice and thereafter will require either the annual membership amount or a paddling charge of $15 per practice. We also offer a great deal where new paddlers can purchase a $30 all you can paddle trial pass which is valid for 30 days and allows unlimited water practices. We encourage people to join because you won’t regret it! *However, one month prior to any local event, the two-free-water-practice policy will be suspended. There will be a $15 fee for all guests and non members at all water practices. Please review the membership page. We plan to compete in at least two major races each year and try to compete in as many local events as we can. Team members will determine additional race events. There will be two types of practice sessions — water-based and land-based. Water practice will involve reviewing team synchronization, paddling technique and sprints while on the water and in a Dragon Boat. Water practices will be located in the Clear Lake or Sugar Land areas. Land based practice will involve fitness activities such as running, strength training and/or aerobic exercises. Land practices will be at Allen Parkway, Memorial Park and other locations. General practice sessions will be held twice a week; however, when training for a race or event, practice sessions will increase to 4 to 5 times a week. Attendance at practice sessions is strongly encouraged and is one factor used by Coaches when finalizing rosters for races and events. Members may be excused from practice for emergency/unpreventable situations. Dragon boat racing is suitable for all levels of fitness with mixed male/female crews; no previous experience is required. Enthusiasm, dedication and genuine team spirit are a must! Is special equipment needed and will it be provided? Dragon Boat paddling is similar to other water sports in that you will need a paddle and a personal floatation device (life jacket). Houston Heat will have equipment available at the water practices. We also suggest comfortable workout/swimming apparel that breathes easily and good water shoes as opposed to sneakers or flip flops. This is a water sport so expect to get wet! We also highly encourage our paddlers to bring reusable plastic water bottles compared to the disposable ones. Houston Heat is going green and we want everyone to know about it! The Houston Heat Dragon Boat Club is continuously accepting sponsorship from individuals as well as corporations. Sponsorship funds go towards equipment rental, practice venue fees, race entry fees and team support. In return, sponsors will be recognized on all printed materials associated with the team; announced on all advertisements; and recognized before each race. Check out the Sponsorship page for more information.